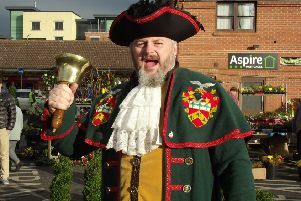 This year’s patriotic St George’s Day Market will be held this Saturday (April 21) in Sleaford Market Place. From 9am to 3pm, there will be a wide variety of stalls across the market, including jewellery, bags, stationery, craft items, art demonstrations of mud hares, preserves, toy prize stall, Sleaford and District Cats Protection, ladies fashions, garden ornaments, the Rotary Club of Sleaford and a stroke awareness ambulance, Lincolnshire sausages, Lincolnshire Wildlife Trust, RAF Regiment Association, glazed pottery and more. There will be entertainment as well, including performances from the Sleaford Ukulele Orchestra at 9.30am, the William Alvey School singers and Chris Clarke at 10.30am and Kesteven Morris Dancers at 12noon. Organised by Sleaford Town Council, their office is still taking pitch bookings, but they do not have any gazebos left available to hire for the day. Contact the Town Council office for further information on 01529 303456, email enquiries@sleaford.gov.uk or message via Facebook page - Sleaford Town Council. On Sunday, Sleaford area Scout, Cub Scout and Beaver groups will form up for their annual St George’s Day Parade at 1.30pm in Sleaford Market Place followed by a short service in St Denys’ Church. There will be no parking in the Market Place from midnight throughout Sunday.